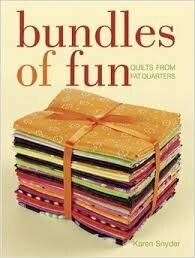 Bundles of Fun features 12 stylish ways to use your fat quarter bundles. From baby quilts to bed quilts, these designs are quick, cute and perfectly coordinated. Cutting diagrams and quilt designs make the most of each fat quarter, while the step-by-step instructions make the process easy. Expert quilter Karen Snyder guides you through the basics of choosing color and offers tips for quilting and labeling each design.